When Jorge Luis Borges described Paradise as "a kind of library," he may have been envisioning this heavenly scene. In Rebecca Campbell's evocative illustration, a reader lounges deep in a cushy armchair in front of a towering wall of books, his faithful pup and cat on watch nearby. 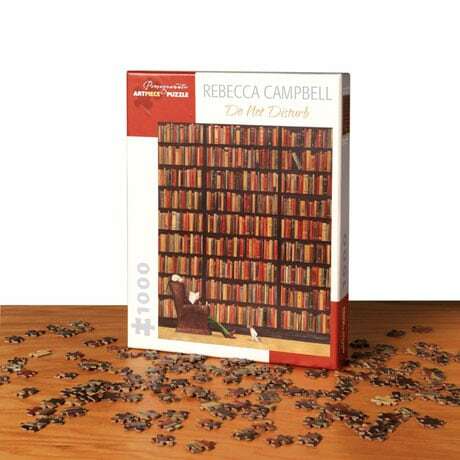 Bibliophiles will delight in the intricate challenge—so many books!—of our 1,000-piece Do Not Disturb Puzzle, which measures 20"x25" when complete.